Here is a card I made using brushed gold card as base. The original idea I got from Pinterest HERE - which has a Crumb Cake base. I used white craft ink directly onto vellum then heat embossed with white embossing powder. I stamped the image three times to get all the layers I wanted. 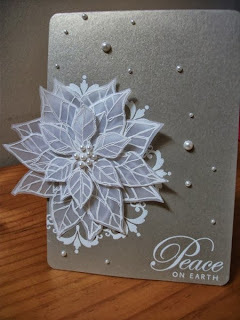 I also stamped on the gold card behind the pointsettia the same way - a sprinkling of pearls and and easy card was done. I'm really pleased with how it turned out! Just LOVE this Joyful Christmas stamp - I have used it SO many times! 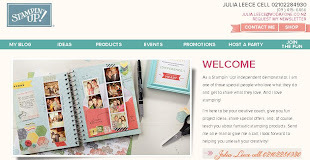 This is absolutely gorgeous Julia .....LOVE IT!!! Such a lovely card. I have this stamp set, looking forward to case your card. TFS!